The main difference between bounce rate and exit rate is that the bounce rate is the percentage of visitors who leave the website from the landing page itself while the exit rate is the percentage of visitors who leave the website from a specific page after having visited any number of pages on the site. Google Analytics is a free Web analytics service that provides statistics and basic analytical tools to perform Search Engine Optimization (SEO) and to support marketing. Anyone who has a Google account can acquire this service. It provides features including data visualization, email-based sharing and communication, integration with other Google products and many more. Bounce rate and exit rate are two calculating parameters used in Google Analytics that help to analyze a website. Therefore, it is very important to know the difference between bounce rate and exit rate. Bounce rate refers to the percentage of visitors who leave the website after viewing the home page. For example, assume that there are two users. The first user visits the website. He does not like the website. Therefore, he leaves the website instantly. The other user visits the website. He does not leave the website. Instead, he clicks on another page and read the content. The first user is bounced. Therefore, we can consider there is a 50% bounce rate. Websites have different bounce rates. In an e-commerce website, there is a large number of products, and the customer will be comparing the selected products with others. Therefore, these websites have a lower bounce rate. Calculating bounce rates help to find the average time a user views a website. To keep a user engaged in a website, the website developer can use techniques such as displaying related blog posts, similar products, the category to which the product belongs, etc. Bounce rate can be higher or lower. If the home page creates the pathway to the other pages and the users are only visiting the home page, then a higher bounce rate is not beneficial. On the other hand, when there is a single page site similar to a blog, then a high bounce rate is fine. However, it is incorrect to consider that a higher bounce rate is always bad because it depends on the website. For example, assume that the user clicks on a Twitter link after visiting the website. It causes a higher bounce rate, but it is beneficial because the user accesses social media. The Bounce Rate (Rb) equation is as follows. Tv refers to total page visits while Te refers to the total entrance visits. Exit rate is the percentage of visitors who leave the website from a specific page after having visited any number of pages on the site. Every page on the website has own exit rates. 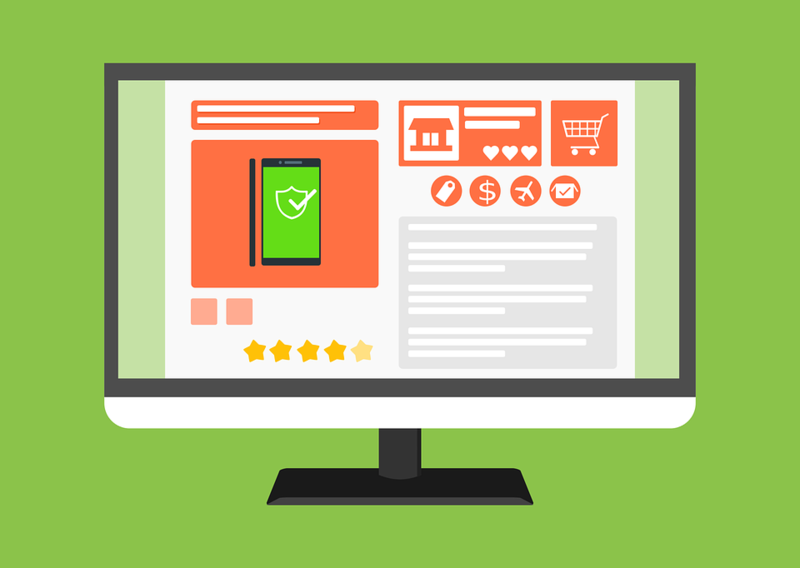 It is not essential to optimize the exit rate for online news or online article website, but it is important for sales websites such as Amazon.com. Because, this kind of website has links from one page to another, similar to a network. The Exit Rate (Re) equation is as follows. T exits refer to the total exits from the page while T views refer to visits to the page. Bounce rate is single-page sessions divided by all sessions or the percentage of all sessions on your site in which users viewed only a single page and triggered only a single request to the Analytics server. Whereas, Exit rate is the percentage of visitors to a site who actively click away to a different site from a specific page after possibly having visited any other pages on the site. Thus, this is the main difference between bounce rate and exit rate. Bounce rate is the percentage of visitors who leave the website from the landing page itself while exit rate is the percentage of visitors who leave the website from a specific page after having visited any number of pages on the site. 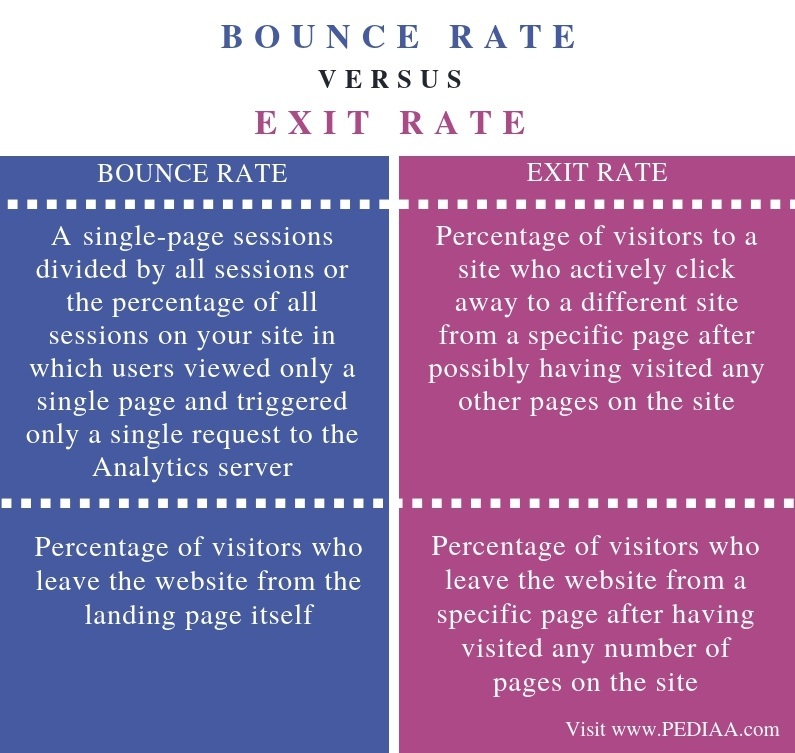 The main difference between bounce rate and exit rate is that the bounce rate is the percentage of visitors who leave the website from the landing page itself while the exit rate is the percentage of visitors who leave the website from a specific page after having visited any number of pages on the site. In brief, it is usually good to have a lower bounce rate, but it can be lower or higher depending on the website. On the other hand, exit rate is important for e-commerce websites. 1. Koozai. What Is Bounce Rate? (Analytics Guide), Koozai, 24 June 2011, Available here. 2. “Exit Rate.” Wikipedia, Wikimedia Foundation, 18 Oct. 2017, Available here. 3. “What Is Google Analytics? – Definition from WhatIs.com.” SearchBusinessAnalytics, Available here. 4. “Bounce Rate – Analytics Help.” Google, Available here.